As promised, I have branched out to a different limb of the literary tree and expanded my blog to have more active participation with the great authors I have met through my Netgalley experience. I was given the opportunity to do an excellent interview with Anna Kashina, author of Mistress of Solstice, this week. Her answers are inspiring to the true meaning of folklore. She really embodied why I feel it is so important to read folk tales of all nationalities to our children. They can be even better when placed in such amazing fiction for adults. If you missed out on my previous review, you can catch it here. You should really take the opportunity to read this fascinating storytelling. If you have not already taken the leap, purchase it here. Amy) As a doctor of veterinary medicine, what made you decide to write? And why not about animals? Anna) Actually, I am not a veterinarian, even though I do work in a veterinary school (and I do love animals). I have a Ph.D. in cell biology and my primary work is biomedical research, as well as teaching vet students. I guess in the end it does not really change the question, does it? I believe that writing is not a decision one can consciously make. Instead, this occupation chooses you. One of the 19th century Russian classics once said that a writer is someone who simply cannot help writing. This couldn’t be more true in my case. Ever since I was little, I was haunted by images and stories that could only be released if they found their way into a piece of fiction. I wrote my first novel when I was six (thankfully, that one did not survive to posterity), and I just kept writing, and perfecting my skills, ever since. Why not about animals? Well, I do have animal characters in some of my books, but they are mostly featured as primal deities, more ancient and powerful than any human. What mainly prevents me from writing about “real” animals is, I guess, the overwhelming emotional responsibility. To me, writing about animals feels like writing about helpless children. I feel too keenly if anything bad happens to them, and I cannot really apply the tools and capabilities of an adult human to get them out of bad situations. In addition, even though my books are usually adventures, my main drive in these books is character development and I feel too constrained when a character is an animal who cannot talk and whose thoughts I cannot relate to in a way I would to a human. Not to mention that elements of romance (which I really enjoy putting into my books) definitely don’t work the same way in the animal world. Because of all these things, I don’t write (or read) any fiction involving animals as main characters. I just can’t. Amy) How did you decide to bring the Slavic mythology to the American publishing industry? Anna) I am a native of Russia, and I moved to America as an adult, so in a way Slavic mythology is in my blood. It is not only close to me because of my cultural background, but I also believe it is fascinating and unique because it blends the elements of East and West like no other folklore does. I always wanted to write stories based on Slavic myths, and “Mistress of the Solstice” is definitely not my last one. One of the reasons for wanting to bring it into American publishing is that I felt it has never been done right before. Even though several American and British fantasy authors had used Slavic mythology as their backdrop, they did not relay a deep understanding of how different this mythology is. It felt a bit like taking a traditional Western fantasy and changing all kings to czars and all names from Mary and John to Vanya and Masha. It seems like this could make the book a Slavic fantasy, but it really is not. 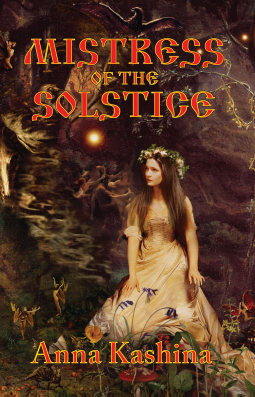 I believe my book, “Mistress of the Solstice” is different because it captures the true essence of the Slavic mythology and hopefully shows to everyone how distinct it is from the Western culture. To some extent, I also incorporated this background into my upcoming adventure fantasy “Blades of the Old Empire”, but in a more subtle way. This book is a true blend of East and West--the way Slavic mythology is. Amy) Do you find folktales an important part of passing culture to future generations? Anna) Definitely yes. I have read folk tales from many different cultures. There is a saying that one picture is worth a thousand words. In the same sense, one short tale could tell so much about the lifestyle, the beliefs, the mentality of each culture, often in very few pages. Folk tales are also among the most lasting forms of art and cultural heritage. Words live on. I hope folk tales will be around for generations to come. Amy) Does the solstice hold any personal significance for you? Anna) I find it a very interesting holiday, one of the most ancient ones, and Russian solstice tradition is particularly fascinating. This tradition survived the establishment of Christianity, the Mongol invasion, the communism--everything. People still celebrate it. We did, when I was in high school, thanks to our teacher, G.A. Sokolova. It is mind-boggling, but true: people still put on flower wreaths and dance around a bonfire; they still brew the potion of love--a tasty herbal tea, so welcome on a chilly Russian June night; they still choose a maiden and throw her into the water (not to drown her, thankfully, but to symbolize the sacrifice). I just felt that this tradition had to be passed on in some form. I hope “Mistress of the Solstice” captures this feeling. You can learn more about Anna and her writings at her website: www.annakashina.com. You can also follow her on twitter @annakashina or Facebook.